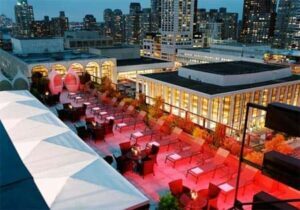 New York nightlife in both Uptown or Downtown offer you lot of choices for a great night out. One person might want to relax in a lounge after dinner, while another prefers to dance all night in a club. Anything is possible, but where should you go? I have listed below some options for nice lounges and bars. There is a beautiful lounge, but no dancing. This is a really exclusive lounge on the fourth floor of the Time Warner Center. Good sofas in a bar with great atmosphere. Lots of romantic corners. At the windows, there is a sweeping view overlooking Central Park. Beer costs $8 and cocktails start at $16. The club is on the roof. Enter through the lobby of the Empire Hotel and take the elevator to the top floor. Beautiful outside area where you can hang out or dance or relax inside on one of the sofas. Bar/restaurant with 40 beers on tap! Nice place to have a beer or sit for a meal at the long table. Happy Hour on weekends is until 19:00 where you can get beer for $3 by the glass. This is a real cocktail bar — one of the best in New York. A flight of stairs up from the ground floor, so it is a bit of an adventure to find. A variety of cocktails set within in Asian décor. Very popular with young adults. Cocktails are $13.